​The RRG takes two inputs. The JdK RS-Ratio values on the x-axis (horizontal) and the JdK RS-Momentum values on the y-axis (vertical). The center point of the plot (100,100) is the base or the benchmark against which all elements in the plot are measured. ​This means that in the top right-hand quadrant, the Leading quadrant, items will show up that are exhibiting a positive trend in their relative strength and this positive trend is still being pushed higher by a positive momentum. As wel all know momentum, or rate of change, is a leading indicator. So as soon as the pace of the RS-Ratio line starts to fade its rate of change will start to decline. When the rate of change turns negative, the RS-Ratio line has formed a top and started to decline. ​At this moment, when the JdK RS-Momentum line drops below the 100-level, the item moves into the lower right-hand, the weakening, quadrant. ​If the weakness in relative strength persists and the negative momentum continues to push the RS-Ratio line down below the 100-level (on the RS-Ratio axis) the element moves into the lower left-hand quadrant of the plot, the lagging quadrant. In that lagging quadrant we find the elements of which relative strength is in a down trend which is still being pushed further down by weak momentum. ​The up-turn follows the same anatomy as the down-turn. The first thing that will happen is that JdK RS-Momentum will start to pick up, signalling that the pace of the down trend is faltering. When the RS-Momentum line crosses above the 100-level a low has been formed in the RS-Ratio line which by that time has started to move up. At that time, when RS-Momentum crosses above 100, the item moves into the top left-hand quadrant, which is labeled the improving quadrant. Items in this quadrant are still showing a negative trend in relative strength but the worst is over and the forming of a low is in process. ​Eventually when this improvement continues the RS-Ratio line will rise above the 100-level as well which brings it back into the top right, leading, quadrant, completing a full rotation. 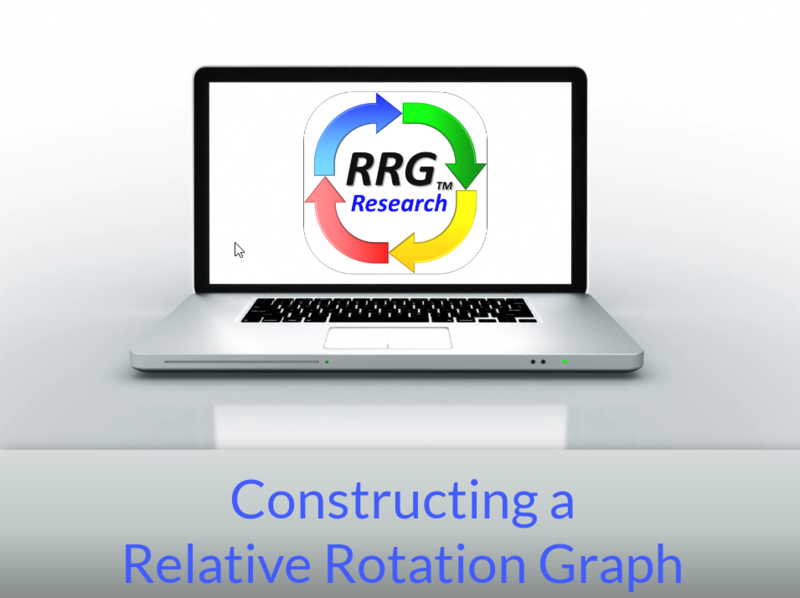 ​In order to put the move of an element through the RRG plot into perspective the observations can be connected which creates a 'trail'. This trail shows the rotation over the past n observations and as it is based on a trend-following approach a continuation of that rotation may be assumed under normal circumstances. A static RRG plot shows the trail over the past n observations, dynamic RRGs show the trail over time moving it forward one observation at a time. This creates the 'snake-like' movement that visualizes rotation of relative strength among elements in a universe.